Sidenote: Normally I’m not a fan of NAR, but I did agree with most of their comebacks (click to see). For Buyers: Realtor Rebates. Free Money or Expensive Savings? For Sellers: Go FSBO! Save $20,000! Realtor Tells All!! I would like to focus on the “savings” comment put forth by 60 Minutes’ case study. “WE SAVED $27,000”* NOTE THE ASTERISK! If some of their agents do as many as 8 closings a week, might it be remotely possible that they might have a strategy of listing low in order to sell fast? I’m not saying they do, but would that make sense to anybody besides me? Got a bidding war going, resulting in a much higher net ($32,000 like our Realtor Megan’s listing, see blog). In my biased opinion, the best way to get the most for the house isn’t to find one buyer, but to find at least TWO buyers. I don’t believe in pricing low to start a bidding war, but I do believe in getting as many buyers into the process as possible. A process that can take an extra 8 hours in one day for one agent, while netting the client another $32,000. Back to the “$27,000 total in savings,” that was for buying and selling. If we assume that they bought a bigger place, they probably “saved” $12,000 on the listing and “saved” $15,000 on the purchase. I’m confident, and I have references to back me on this, that I can consistently do at least $12,000 higher than a discount agent. I wish there was a way to prove this with statistics, but they would just be manipulated. 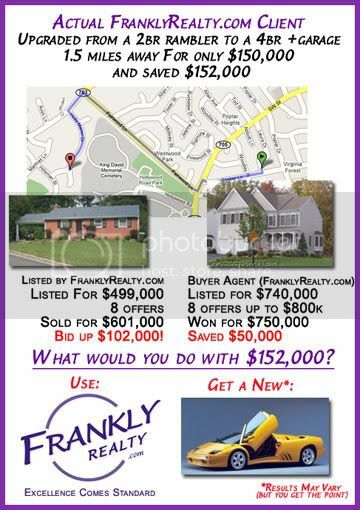 FranklyRealty.com Saves Client $152,000 should be the next 60 minutes update. t I got them (their words). Then on their purchase, they loved a house that was getting 8 offers. At FranklyRealty.com we don’t write normal looking offers, and that sets us apart immediately . Each offer is different. I can’t publish all my tricks here, but when was the last time that you saw a contract that put the Realtor’s ENTIRE commission on the line as a promise that we wouldn’t renegotiate the offer? That is powerful. Also we run a CRA ™ Comparative Realtor Analysis report (see it here on RealtyTimes.com) amongst many other systems that net our client more. A good agent should approach buying a house like an acquisition of a company. Thus winning contracts for less. In this case the 8 offers were bid up to approximately $800,000. Why in the world would somebody take our lower offer? Well because money is not the only motivating factor. When we got that house for only $750,000 my clients were in shock after just getting approved by the lender to get bid up to $800,000. They saved $50,000. So it doesn’t matter if the market is hot, cold or you are buying or selling, an aggressive agent can save you much more, and do it in a way that all parties are smiling in the end. Ok, I got sidetracked. The point is that what a great agent does can’t be compressed into 8 closings a week per agent. I used to rebate… but then I got… good. Don’t miss another blog, get it via email. Sign up now (spam-free) on the right side of the page. Your post is a perfect example of what a true professional does. Very good Frank. Thanks for the shout out, Frank. Frank, well thought out post. Frank, I’m sorry to say that $152k will not get me a new Lambo, so I’m now accusing you of false advertising! When I watched the segment on Sunday my immediate thought when she said “saved $27000” was what you eloquently wrote out. Yes, there’s a possibility that the did come out ahead and that Redfin did a good job. But I’m not yet convinced. I can sell any house at list…….it’s a matter of how low I list it. Unless the seller is in a jam and needs to sell in a hurry, I’m not sure how that’s a benefit. You “save” money by selling your house way under. My other issue with Redfin from a business standpoint is why would they rebate 2% on the buyers side? Assuming 3%, you’re giving away 2/3 of your profit. I can see rebating and don’t have a problem with it, but I know most clients would be elated to get a percent back. I feel Redfin’s undercutting their own profits. Hey Tchaka, How about a used Lambo? Oh I understand the logic behind it, but I still think it’s bad business sense. I am happy getting a point back as are most people. I would be elated to get 1.5% back, again as would most. I am willing to bet there are diminishing returns at 2%. I’m sold at 1-1.5%. Keep in mind that I’m playing the role of someone who doesn’t know the benefit of a full-service realtor. Frank-Bravo! One of the best responses I have heard to the redfin lies! Hey Dan, I don’t think Redfin is lying at all. They are doing a great job at marketing their company. Why shouldn’t they? 60 Minutes is the one that made the one sided story. You cited ZipRealty as another discount firm in your blog. ZipRealty is a full service brokerage. Our business model is completely unlike Redfin’s. On the listing side, we offer full services plus a featured listing on our national website. Services include professionaly printed brochures, professional photographs and virtual tours, open house advertising in the local papers, syndication of the listing to other real estate sites, open houses, for sale sign, inclusion on the MLS, as well as full representation all the way to the closing. We provide as much as, and probably more than most traditional brokerages. Our commission fee may be a little lower and varies with the market. In Southern California we try to get 5%, although other brokerages may try to get 6%, I read that the national average is about 5.2%. We offer the buyer’s agent competitive market rate commissions. On the buyer’s side, we get most of our leads from the ZipRealty website. To have these leads stay with us, we offer them 20% of our commission on the buy side as a rebate, which is acceptable and legal in our markets. Again we offer buyers full service and full representation. This includes showing them properties and whatever other assistance they need. We attend the inspections with them. If you take the time to review what we do, you will not associate us as a discount firm. We take pride in our full service and customer care. We have one of the highest customer satisfaction rates in the overall industry. ZipRealty is a publically traded national real estate company which a presence in most of the major US metropolitan markets. We are continuing expand into other metropolitan markets. We are Internet based, however we offer personal local service to our clients. It is an insult to call us a discount brokerage and associate us with Redfin. Please correct your blog, since you must have misunderstood what ZipRealty is about. But ZipRealty used to discount more when they first started didn’t they? Kinda like… Redfin (but not as extreme). They have reduced what they give as rebates and they make it harder to give rebates…. Why? Probably because they got good!! Their website searching capabilities are matched by few others (as in REAL functionality, not just your typical big name MLS regurgitation website) , and they started to figure out… wow, people don’t really care as much about getting a rebate, they care more about an awesome product and services. With the web traffic that ZipRealty gets, and their great website, I wouldn’t be surprised if they removed the rebate and didn’t miss a step. Mike, I’d love to hear your take on ZipRealty agents being paid pennies on a salary basis as described in that other blog. Is it true? Is there high turn over? Are they employees or does each agent work under the same model as a Remax? Thanks for the reply. I still think there is a difference between offering a rebate and being a discounter. I recently went to Bloomingdales Home Store and bought a Cuisinart coffee maker that they had on sale and which had a manufacturers rebate. I don’t think most people would consider Bloomingdales as a dicounter nor Cuisinart as a discount product. I could have gone to K-Mart and bought a Mr. Coffee product. I think there is a difference. Thanks for pointing out that we have an exceptional website that offers the consumer a lot. That is one of the key unique part of our business model. I have only been with ZipRealty for a year and a half although I have been doing real estate for 7 years. Therefore I cannot speak on what they did years ago. It is a relatively new company started in 1999, so I am sure there has been an evolution over the 8 years. As for commission splits they are relatively low but in line with starting splits at most other brokerages. I worked at two other conventional brokerages in the past. However the lead generation provides us more business. I would rather sell 3 properties at a 50% split than one at an 80% split. You do the math and you will see I am grossing more money. In addition we get bonuses for customer satisfaction based on closing surveys of the buyers. Technically we are employees, although we do not receive a salary and our compensation is by commission. However we get reimbursed for some expenses such as association and MLS fees, cell phone costs, ISP costs, milage, etc. The company also pays for signs, business cards, professionally printed brochures, marketing materials, and professional photographs and virtual tours of listings. Thus our operating expenses are low which increases the net amount we make from our commissions. We work from our homes, thus the company does not have the overhead expense of maintaining agent offices. This combined with technology allows us to offer the rebates to buyers and a slighty lower commission to sellers. As for turnover, there is a lot in our industry. In my district I do not see the turnover to be any higher than with the previous two companies I worked for. 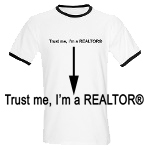 I cannot comment on RE/MAX, since I have not worked for them. They are a franchise so it may depend on the individually owned offices. I hope you now have a better understanding of our company. I think you understand now that we are a full service, similar to the traditional firms, with a technology twist. We are not like nor do we agree with the Redfin model, however they are free to try whatever they want. I just do not want ZipRealty to be associated with their business model. We are much different than Redfin and more in line with the conventional brokerages. The most amazing thing to me in this post is the pictures of the houses. These homes would sell for around $125,000 and 250,000 in our area. Geez. Your point is relying too heavily on a transaction you closed during the loose-money, irrational exuberance peak… but anecdote becomes data if you have enough anecdotes so I’ll give you the benefit of the doubt. There’s a foreclosure at 2008 North Cleveland St, Arlington, VA 22201. It’s a 2/1.5 988sqft listing for 609k by L&F-Greenbelt. The prev owner bought for 570k and then defaulted on the 80%, bank probably wrote-off the other loan. “As is”, new kitchen, cozy, nice yard, definitely needs some work as it has cracked windows, unfinished basement, etc. Shocker, I think it’s too high… especially since the prev owner bailed on 40k less than the current list. Initial thoughts on price? I knew you would harp on the time of the marketplace (bidding days). You must have been speed reading though. The part that was impressive wasn’t so much the $101,000 increase (well actually that was impressive EVEN in the biddin war days), but the purchase that was made for $50,000 UNDER the top contract, also during the same bidding days. So regardless of the marketplace, a good agent can get you a better NET. I really doubt your friends at Redfin would have taken the extra steps to help them REDUCE their own commission (lower price= lower commission) and help their clients save a bundle. I could be wrong. Show me a Redfin agent that does that, and I’ll show him a pay raise. As for the foreclosure, are you going to the 1021 foreclosure today? The other 1021 foreclosure didn’t even make it to the courthouse steps. yes, the 50k under top bid was impressive. and RedFin recruits local agents w/ a minimum number of closings (according to their propoganda) so they have some experience and get paid based on a customer satisfaction survey – don’t know what questions they ask. can’t make it to the steps of the courthouse today, unfortunately. i’m more interested in the SFHs in foreclosure. they are popping up all over, more so along 4 Mile Run/Walter Reed… 22204 is a target rich environment. the lenders really took that zip for a ride. Most people don’t live in a bid-war market. Glad you can do that. Quite a few assumptions here and quite an ego – both serve you well. Anonymous. Yes, because I’ve seen what super-egos do to non-believers. Selecting reading will do that. It doesn’t matter what marketplace it is, a good agent, with an ego or not, can save you more. In a “bad” market, an aggressive agent will take FAR more time and energy and get you a lower net. In my opinion, a rebater will want to just get the deal done fast! Can you email me directly? I’d love to keep tabs on the progress of your sale, especially what you close for. Has anyone else really pulled their statistics? Hey Anonymous, Do you mean sell homes or sell the company? I like Redfin. And sure they sell homes. I just sent somebody over to Redfin today.